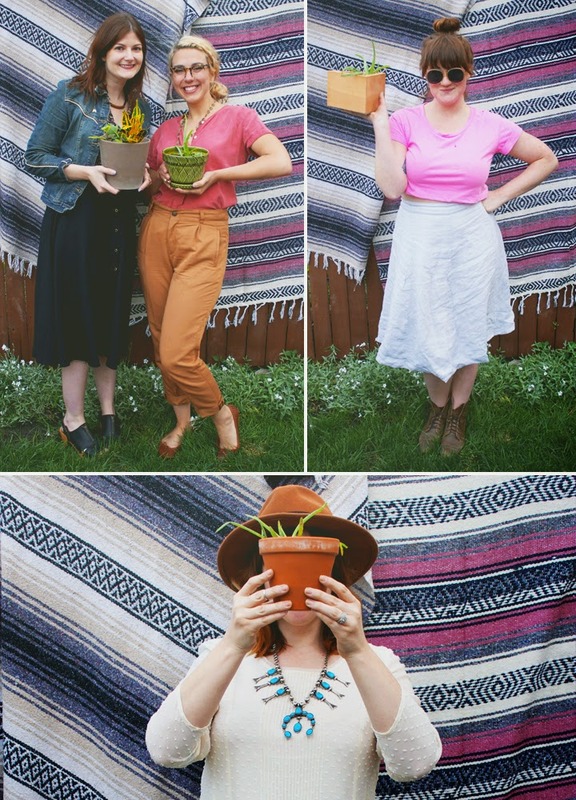 Over the weekend we hosted a plant potluck in Lauren's backyard. What on earth is a plant potluck, you say? Well, it's totally just like it sounds. We gathered together five friends and spent an afternoon in the sunshine potting plants, sipping sparkling sangria, and sharing snacks. We provided the soil and a few clippings from plants in our homes and asked everyone to bring a pot or planter for themselves or to share. It was just like a regular ol' potluck, but with way more dirt under our fingernails! Flora, friends, and food sounds like your idea of fun? 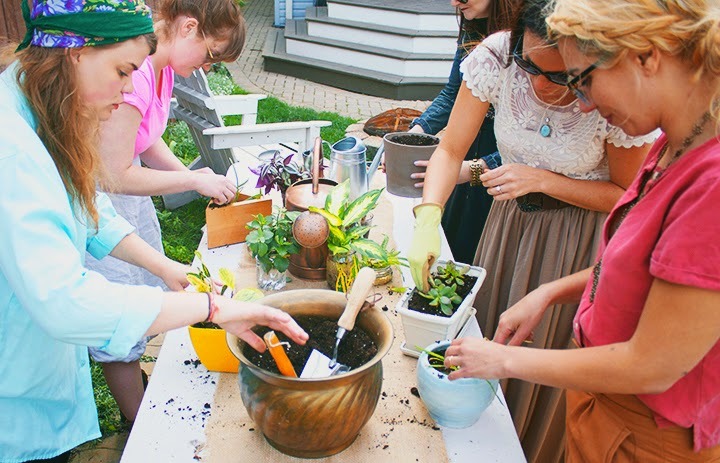 Below we share our tips on how to throw the perfect plant potluck! 1 // At a potluck, you want a mix of main dishes, sides, desserts, and drinks. A plant potluck is no different! 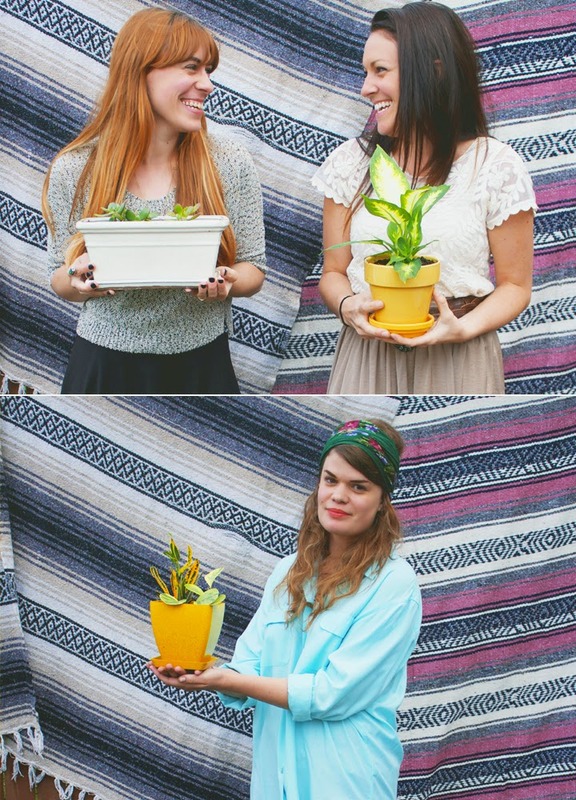 Assign each friend a type of plant to bring (hanging, flowering, succulent, etc). Have one friend bring the soil, another bring the planters. Someone can provide gardening tools or gloves. Let the variety happen organically. 2 // Did you know that you can take a clipping from pretty much any plant, put it in a cup of water and the clipping will sprout roots within a week or two? Pretty cool, right? 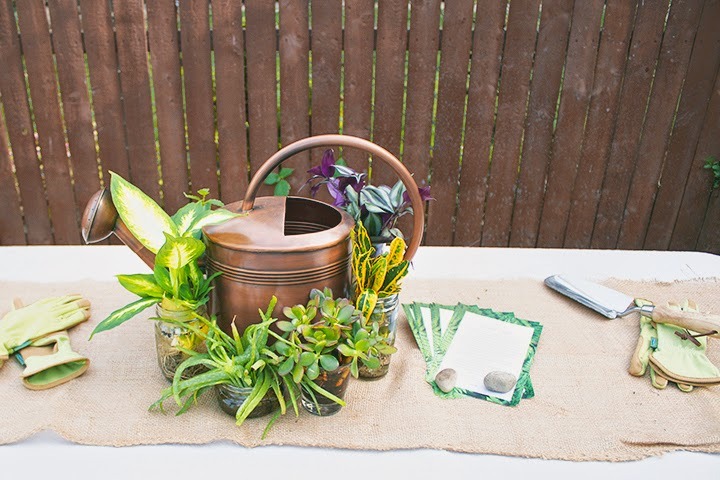 Get creative with how you source your plants. Visit your local nursery, grab an herb plant from the farmers market, bring a clipping from your favorite house plant, or snip something from the side of the road. We used rooted clippings from plants in our homes. 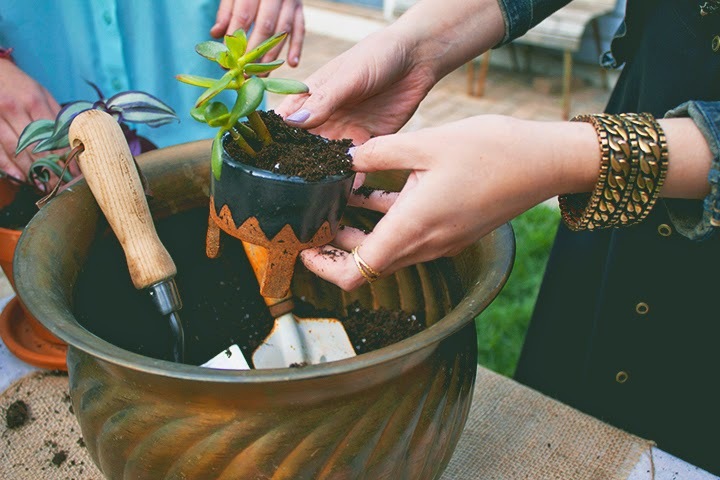 We adore the idea of passing on a little piece from a plant that has been loved and cared for previously. Most of the clippings we chose could be mixed or matched in a pot and it was fun to get creative with the variety. 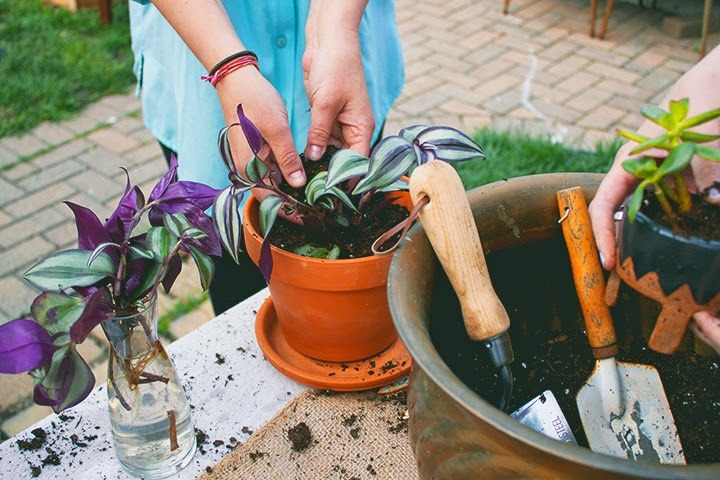 3 // Give a crash course in caring for house plants. 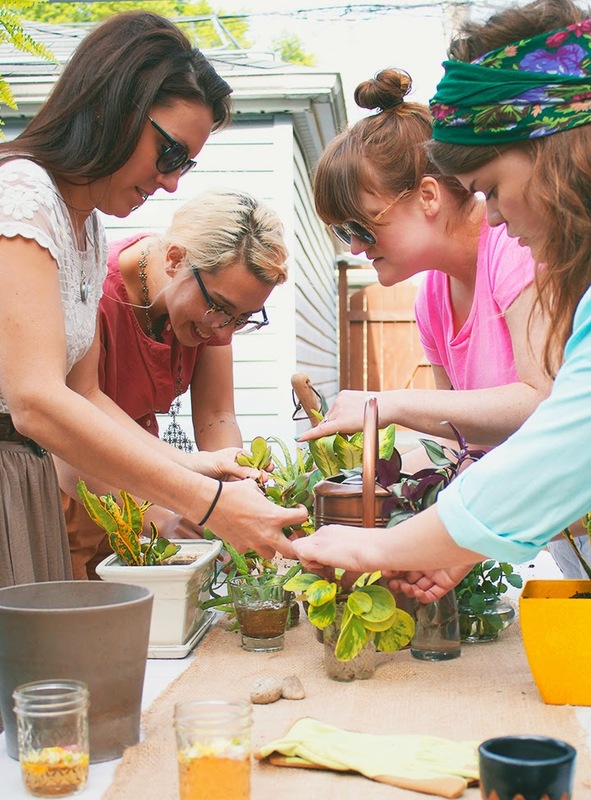 Does your best friend have a particularly green thumb? Ask her to share her gardening secrets. We sent everyone home with a little hand out that gave a break down of when to water and how much sun each plant needs. 4 // Get dirty! 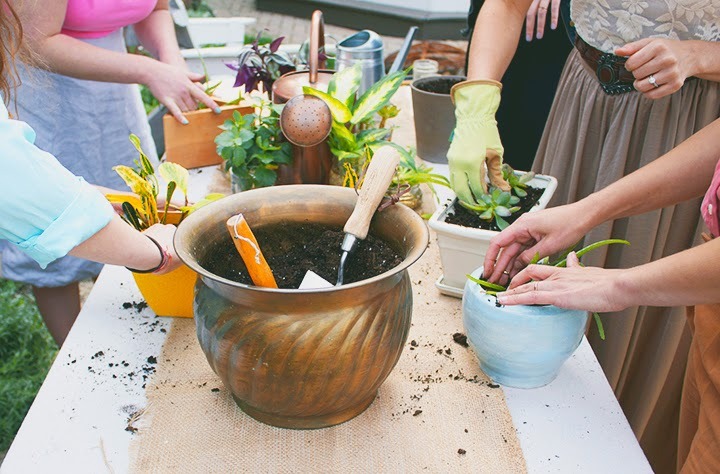 Forgo the gloves and get your hands in the soil. Appreciate just how lovely the mess you're making is. Everyone was so proud of their newly potted sprouts! We even set up a spontaneous photo booth just so we could model with and show off our little friends! After we got our hands a little dirty, we spent the rest of the afternoon laying on blankets in the lawn, swapping stories and laughing. As the sun went down, we lit a bonfire and Claire broke out a lemon and rosemary pie. Pretty much the perfect end to a perfectly beautiful day. Thanks, Katie! It was such an easy gathering to host and so much fun. 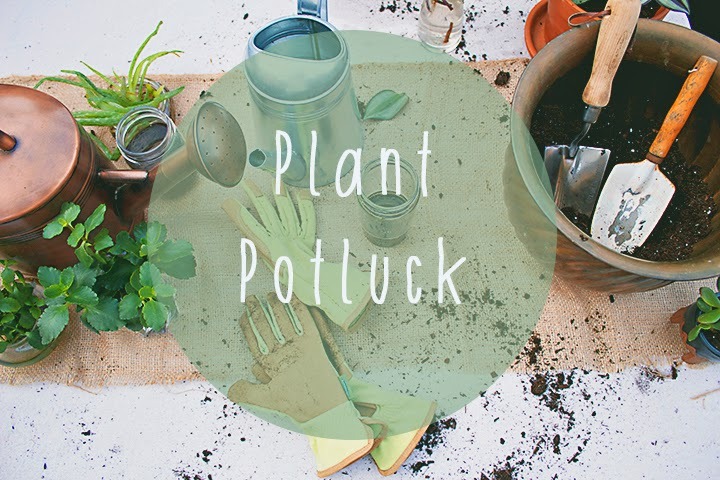 We highly recommend throwing a plant potluck of your own! Isn't it so perfect!? And guess who made it...Attalie of Shades of Grey! We swear everything that girl touches is gold. Her talent just knows no bounds. I had the best time!!! Thanks again for inviting me...can't wait to see more events like this from you guys!